Burlington was first incorporated on October 24, 1693, and was reincorporated by Royal charter on May 7, 1733. After American independence, the city was incorporated by the State of New Jersey on December 21, 1784. On March 14, 1851, the city was reincorporated and enlarged with portions of the surrounding township. Burlington was originally the county seat of Burlington County. In 1796, in response to the growth of population to the east away from the Delaware River, the county seat was moved to Mount Holly Township, a more central location. The council of West Jersey Proprietors purchased roughly 30 miles (48 km) of riverfront land in 1676 from the Lenape Native Americans. Burlington was founded on part of that land by English settlers (primarily Quakers) in 1677. It served as the capital of the province until 1702, when West Jersey and East Jersey were combined into a single Crown Colony. Burlington takes its name (including the county name) from the English east-coast town of Bridlington, of which Burlington was a district. It is now amalgamated into the larger Bridlington town. The Quakers formally established their congregation in 1678. Initially, they met in private homes; between 1683 and 1687, Francis Collings constructed a hexagonal meeting house of brick. Over the next century, the membership grew substantially and a larger building was needed. The present meeting house on High Street was built in 1783 in front of the old meeting house and cemetery. The cemetery predated the first building. A tablet commemorates that the Lenape chief King Ockanickon, a loyal friend of the English settlers, was buried here in 1681. The oldest gravestone is inscribed "D.B. 1726." Many notable Quakers are buried here. One of the oldest buildings in Burlington is known as the Revell House. Originally built in 1685 for George Hutchinson, it stood on East Pearl Street. The property was purchased by Thomas Revell, one of the original Anglo-European settlers. Local tradition associates this house with the young Benjamin Franklin, who received gingerbread from the household while traveling from Boston to Philadelphia. In the early 20th century, the house was purchased by the Annis Stockton Chapter of the DAR for use as their clubhouse. The Colonial Burlington Foundation acquired and restored it in the 1950s. The original St. Mary's Episcopal church, built in 1703, is the oldest church in New Jersey. Many institutions established in the 18th century continue to function in the 21st century. After the Quakers, the second oldest religious congregation in Burlington were the Anglicans (later known as Episcopalians). Their original church, Old St. Mary's, is the oldest church in Burlington and New Jersey. The congregation was founded in 1702 by George Keith and John Talbot. Talbot became the first minister and laid the cornerstone for the church in 1703. He served as the church's rector until 1725. The congregation prospered, and the church became the see of the Anglican bishops of New Jersey. After the Revolution, the Episcopal Church in the United States was established. In 1846, under the leadership of Bishop and Rector George Washington Doane, construction was begun on New St. Mary's. This early Gothic Revival architecture church was designed by Richard Upjohn, who also designed Trinity Church at the foot of Wall Street in Lower Manhattan. In the late 20th century, this building was designated as a National Historic Landmark (NHL). Bishop Doane founded an Episcopal girls' boarding school, St. Mary's, in Burlington in 1838, at a time when interest in girls' education led to development of schools for them in many areas. Girls from families up and down the East Coast came to study there, from as far as New England, Virginia, and upstate New York. St. Mary's provided a classical education, as well as classes in arts and music. The Library Company of Burlington was organized in 1757 as a "free" library open to the public as well as members. There were 60 members of the original Library Company, each paying ten shillings per year to support the institution. The Library received a Charter from King George II of Great Britain in 1758. The Library's books were kept in members' homes for a few years: Thomas Rodman's at 446 South High Street and, after 1767, Robert Smith's at 218 High Street. In 1789 the Library moved to its own building. In the early 21st century, the Library is housed in a stone building that was built on West Union Street in 1864. The Burlington Library is the oldest continuously operating library in New Jersey and the nation's seventh oldest. The Endeavor Fire Company was organized in 1795. It was one of the four companies in the Burlington Fire Department when it was organized almost a century later. Endeavor was the first permanent firefighting organization in Burlington and remains one of the oldest fire companies under its original name in the state. By 1882, the company had relocated to its present building, which was erected in 1852 as a Market House. Burlington has been the home of many notable people including John Lawrence, a politician and his son, Captain James Lawrence. The elder Lawrence served in the State Assembly, as Mayor of Burlington, New Jersey in 1769, and as a member of the Provincial Council from 1771 to 1775. He was suspected of being loyal to the British during the Revolution, which ended his career. His son was born on October 1, 1781, and became a legend during the War of 1812 with the command "Don't Give Up the Ship." Lawyer and writer, James Fenimore Cooper, who wrote The Last of the Mohicans, was also from Burlington. His father was a merchant there before buying land and developing Cooperstown, New York after the Revolution. As education for girls and young women became emphasized in the 19th century, Bishop George Washington Doane founded St. Mary's Hall in 1937 in association with the Episcopal diocese as the first Episcopal boarding school offering a classical education for girls. In the 20th century, a boys' school was added. It is now known as Doane Academy and is a private, co-educational school for grades from Pre-K through 12th. The building at 301 High Street houses the oldest continuously operating pharmacy in New Jersey. Originally a dwelling, the ground floor was converted to commercial use around 1845 by William Allinson, a druggist, local historian, and leading Quaker abolitionist. He used the building as a center of anti-slavery activity. John Greenleaf Whittier denounced slavery from the doorstep, and local tradition holds that fugitive slaves hid in tunnels under the building in their passage on the Underground Railroad. New Jersey ended slavery, but many fugitives wanted to go further north, beyond the reach of slave catchers. During the 19th century, Burlington City was known for the quality and quantity of its manufacturing. The shoe industry rivaled shipbuilding and canning in prominence. The 1850 United States Census indicates that the largest number of men were employed in the shoe industry, followed closely by carpentry and bricklaying. J. Frank Budd got his start in the shoe business at a Burlington shoe company just after the Civil War. In 1887, J.F. Budd broke ground for a children's "shoeworks" at the corner of Penn and Dilwyn streets. The company employed approximately 325 people and operated six days a week for ten hours a day. The J.F. Budd Baby Shoe Company billed itself as the "largest baby shoe plant in the world." The commercial activity provided revenues for the City's cultural activity. In 1839, a Lyceum was erected as a venue for lectures, concerts, and public meetings. It served in that capacity until 1851, when it was turned over to the city to be used as the City Hall. The municipal offices' move was concurrent with the adoption of a new City charter. The Oneida Boat Club was organized in 1873 by a group of 10 members. It is named for one of the original Five Nations of the Iroquois Confederacy, based in New York. Over the next few years, membership in the club grew rapidly. In 1876, they dedicated their newly built clubhouse on the banks of the Delaware River at York Street. The Oneida is the oldest continuously operating boat club located on the Delaware River. During the 19th century, the City of Burlington developed in a grid pattern from the main crossroads of High and Broad streets. Blocks of attached rowhouses built in the latest architectural style characterize the city as a 19th-century town. Ferries carried traffic across the Delaware River to Pennsylvania before bridges were built. This historic carriage house now houses the local tourism office in Burlington. Burlington's waterfront park along the river was developed as a result of urban renewal and flood control projects in the late 1960s and 1970s. The shoreline improvements—revetments, walkways, etc.—span the city's Delaware riverfront from the Burlington-Bristol Bridge to Assiscunk Creek. The remains of former waterfront industries, ferry terminals, and docks were demolished. Development of an open, grassy park with a tree-lined waterfront esplanade has reconnected city residents to the riverfront for recreation. This also ensures that business properties are not at risk during floods and reduces damages. In this period, the United States federal and state governments began to value their historic assets more highly, and efforts were made to preserve structures that were significant to the layered history of places. In addition to recognition of individual structures, such as the National Historic Landmark St. Mary's Church, the city has two historic districts listed on the National Register of Historic Places, with multiple contributing buildings: the Burlington Historic District includes structures from both the eighteenth and nineteenth centuries. It is adjacent to the city's High Street Historic District. The Oneida Clubhouse narrowly escaped demolition during the urban renewal campaign. It was saved and renovated. As the new esplanade was built on fill that added land between the building and river's edge, it created a landlocked clubhouse for the boat club. Burlington Coat Factory was founded in 1924 as a wholesaler of ladies' coats and outerwear. The modern company was formed in 1972 when Monroe Milstein purchased a warehouse in the outskirts of the city of Burlington. He started selling coats and outerwear there at discount prices. The company gradually added other apparel, including suits, shoes, and accessories, and has branched out to include baby items and linens, all at discount prices. The company's corporate headquarters was moved from the city to Burlington Township in 1988. The Burlington Coat Factory relocated to a new store site in the fall of 2008. According to the United States Census Bureau, the city had a total area of 3.782 square miles (9.793 km2), including 3.063 square miles (7.932 km2) of land and 0.719 square miles (1.861 km2) of water (19.00%). Unincorporated communities, localities and place names located partially or completely within the city include Burlington Island and East Burlington. Burlington borders Burlington Township in Burlington County and both Bristol and Bristol Township across the Delaware River in Pennsylvania. The Burlington-Bristol Bridge crosses the Delaware River, connecting Burlington to Bristol. As of the 2010 United States Census, there were 9,920 people, 3,858 households, and 2,438.256 families residing in the city. The population density was 3,239.1 per square mile (1,250.6/km2). There were 4,223 housing units at an average density of 1,378.9 per square mile (532.4/km2). The racial makeup of the city was 58.92% (5,845) White, 32.98% (3,272) Black or African American, 0.18% (18) Native American, 2.03% (201) Asian, 0.04% (4) Pacific Islander, 2.29% (227) from other races, and 3.56% (353) from two or more races. Hispanic or Latino of any race were 6.50% (645) of the population. There were 3,858 households out of which 27.3% had children under the age of 18 living with them, 37.6% were married couples living together, 20.0% had a female householder with no husband present, and 36.8% were non-families. 30.8% of all households were made up of individuals, and 13.9% had someone living alone who was 65 years of age or older. The average household size was 2.53 and the average family size was 3.18. In the city, the population was spread out with 23.9% under the age of 18, 8.6% from 18 to 24, 25.5% from 25 to 44, 26.4 % from 45 to 64, and 15.7% who were 65 years of age or older. The median age was 38.9 years. For every 100 females there were 87.7 males. For every 100 females ages 18 and older there were 83.8 males. The Census Bureau's 2006–2010 American Community Survey showed that (in 2010 inflation-adjusted dollars) median household income was $48,317 (with a margin of error of +/− $3,334) and the median family income was $62,049 (+/− $6,446). Males had a median income of $43,146 (+/− $7,469) versus $40,929 (+/− $3,562) for females. The per capita income for the borough was $24,612 (+/− $1,541). About 10.6% of families and 11.8% of the population were below the poverty line, including 13.0% of those under age 18 and 7.4% of those age 65 or over. As of the 2000 United States Census there were 9,736 people, 3,898 households, and 2,522 families residing in the city. The population density was 3,245.1 people per square mile (1,253.0/km2). There were 4,181 housing units at an average density of 1,393.6 per square mile (538.1/km2). The racial makeup of the city was 68.18% White, 26.62% African American, 0.27% Native American, 1.28% Asian, 0.01% Pacific Islander, 1.29% from other races, and 2.34% from two or more races. Hispanic or Latino of any race were 3.41% of the population. There were 3,898 households out of which 27.8% had children under the age of 18 living with them, 41.6% were married couples living together, 17.8% had a female householder with no husband present, and 35.3% were non-families. 29.9% of all households were made up of individuals and 14.3% had someone living alone who was 65 years of age or older. The average household size was 2.48 and the average family size was 3.09. In the city the population was spread out with 23.9% under the age of 18, 7.7% from 18 to 24, 29.8% from 25 to 44, 21.8% from 45 to 64, and 16.8% who were 65 years of age or older. The median age was 38 years. For every 100 females, there were 90.2 males. For every 100 females age 18 and over, there were 84.3 males. The median income for a household in the city was $43,115, and the median income for a family was $47,969. Males had a median income of $38,012 versus $28,022 for females. The per capita income for the city was $20,208. About 5.4% of families and 8.0% of the population were below the poverty line, including 11.2% of those under age 18 and 7.0% of those age 65 or over. The City of Burlington is governed within the Faulkner Act (formally known as the Optional Municipal Charter Law) under the Mayor-Council form of municipal government (Plan 4), implemented based on the recommendations of a Charter Study Commission as of January 1, 1992. The governing body consists of a mayor and a seven-member Common Council, all elected on a partisan basis in a vote held as part of the November general election. The Mayor serves a four-year term of office. The Common Council consists of seven members, each serving four-year terms of office: three at-large Councilpersons are elected to represent the entire City. Four are elected from single-member districts, known as wards. The three at-large and mayoral seats are up for election in one cycle, and the ward seats are elected two years later. As of 2016, the Mayor of Burlington City is Democrat Barry W. Conaway, whose term of office ends December 31, 2019. Members of the City Council are Council President Suzanne Woodard (At-Large; D, 2019), Vice President David Babula (At-Large; D, 2019), George Chachis (Ward 1; D, 2017 – appointed to serve an unexpired term), Helen F. Hatala (Ward 3; D, 2017), Ila Marie Lollar (Ward 4; D, 2017), Jeanette M. Mercuri (At-Large; D, 2019), Thomas J. Swan (Ward 2; R, 2017). In January 2016, the City Council appointed George Chachis to fill the Ward 1 seat expiring in 2017 that had been held by Barry Conaway until he was appointed as mayor. As of 2013, Burlington City is located in New Jersey's 3rd congressional district. It is part of New Jersey's 7th state legislative district. Burlington County is governed by a Board of chosen freeholders, whose five members are elected at-large in partisan elections to three-year terms of office on a staggered basis, with either one or two seats coming up for election each year; at an annual reorganization meeting, the board selects a director and deputy director from among its members. As of 2018, Burlington County's Freeholders are Director Kate Gibbs (R, Lumberton Township, term as freeholder and as director ends December 31, 2018), Deputy Director Linda Hughes (R, Evesham Township, term as freeholder and as deputy director ends 2018) Tom Pullion (D, Edgewater Park, 2020), Balvir Singh (D, Burlington Township, 2020), and Latham Tiver (R, Southampton Township, 2019). Burlington County's Constitutional Officers are County Clerk Tim Tyler (R, Fieldsboro, 2018), Sheriff Jean E. Stanfield (R, Westampton, 2019) and Surrogate Mary Ann O'Brien (R, Medford, 2021). As of March 23, 2011, there were a total of 5,765 registered voters in Burlington City, of which 2,813 (48.8% vs. 33.3% countywide) were registered as Democrats, 795 (13.8% vs. 23.9%) were registered as Republicans and 2,150 (37.3% vs. 42.8%) were registered as Unaffiliated. There were 7 voters registered to other parties. Among the city's 2010 Census population, 58.1% (vs. 61.7% in Burlington County) were registered to vote, including 76.4% of those ages 18 and over (vs. 80.3% countywide). In the 2012 presidential election, Democrat Barack Obama received 3,138 votes here (72.0% vs. 58.1% countywide), ahead of Republican Mitt Romney with 1,146 votes (26.3% vs. 40.2%) and other candidates with 35 votes (0.8% vs. 1.0%), among the 4,356 ballots cast by the city's 6,097 registered voters, for a turnout of 71.4% (vs. 74.5% in Burlington County). In the 2008 presidential election, Democrat Barack Obama received 3,285 votes here (69.9% vs. 58.4% countywide), ahead of Republican John McCain with 1,308 votes (27.8% vs. 39.9%) and other candidates with 55 votes (1.2% vs. 1.0%), among the 4,697 ballots cast by the city's 6,117 registered voters, for a turnout of 76.8% (vs. 80.0% in Burlington County). In the 2004 presidential election, Democrat John Kerry received 2,819 votes here (64.2% vs. 52.9% countywide), ahead of Republican George W. Bush with 1,486 votes (33.8% vs. 46.0%) and other candidates with 37 votes (0.8% vs. 0.8%), among the 4,390 ballots cast by the city's 5,832 registered voters, for a turnout of 75.3% (vs. 78.8% in the whole county). In the 2013 gubernatorial election, Republican Chris Christie received 1,422 votes here (50.9% vs. 61.4% countywide), ahead of Democrat Barbara Buono with 1,284 votes (46.0% vs. 35.8%) and other candidates with 30 votes (1.1% vs. 1.2%), among the 2,793 ballots cast by the city's 6,115 registered voters, yielding a 45.7% turnout (vs. 44.5% in the county). In the 2009 gubernatorial election, Democrat Jon Corzine received 1,622 ballots cast (59.6% vs. 44.5% countywide), ahead of Republican Chris Christie with 881 votes (32.4% vs. 47.7%), Independent Chris Daggett with 129 votes (4.7% vs. 4.8%) and other candidates with 48 votes (1.8% vs. 1.2%), among the 2,723 ballots cast by the city's 6,010 registered voters, yielding a 45.3% turnout (vs. 44.9% in the county). The historic William R. Allen School was originally built for the education of black children. The City of Burlington Public School District serves students in pre-kindergarten through twelfth grade. The district is one of 31 former Abbott districts statewide, which are now referred to as "SDA Districts" based on the requirement for the state to cover all costs for school building and renovation projects in these districts under the supervision of the New Jersey Schools Development Authority. As of the 2014-15 school year, the district and its five schools had an enrollment of 1,634 students and 171.9 classroom teachers (on an FTE basis), for a student–teacher ratio of 9.5:1. The schools in the district (with 2014-15 enrollment data from the National Center for Education Statistics) are Elias Boudinot Elementary School (93 students; in grades K-2), Captain James Lawrence Elementary School (173; PreK-2), Samuel Smith Elementary School (318; PreK-2), Wilbur Watts Intermediate School (413; 3-6) and Burlington City High School (705; 7-12). The district's high school serves as a receiving school for students in grade nine through twelve from Edgewater Park Township, as part of a sending/receiving relationship with the Edgewater Park School District. Students from Burlington City, and from all of Burlington County, are eligible to attend the Burlington County Institute of Technology, a countywide public school district that serves the vocational and technical education needs of students at the high school and post-secondary level at its campuses in Medford and Westampton Township. Doane Academy, a co-educational, Episcopal college-preparatory school, was founded as St. Mary's Hall, a boarding school for girls, by George Washington Doane in 1837. The name was shortened from St. Mary's Hall-Doane Academy in March 2008. All Saints Catholic Grade School (Pre-K though 8th grade) closed in June 2006 with several other Catholic schools in the Roman Catholic Diocese of Trenton due to low enrollment, after 75 years of operation, based on recommendations issued in 2005 to help improve diocese finances. As of May 2010, the city had a total of 42.76 miles (68.82 km) of roadways, of which 35.71 miles (57.47 km) were maintained by the municipality, 4.36 miles (7.02 km) by Burlington County, 2.30 miles (3.70 km) by the New Jersey Department of Transportation, and 0.39 miles (0.63 km) by the Burlington County Bridge Commission. Burlington is served directly by U.S. Route 130 and New Jersey Route 413. Interstate 95, Interstate 295 and the New Jersey Turnpike all pass fairly close to the city and are easily accessible from Burlington. The Burlington-Bristol Bridge, part of Route 413, crosses the Delaware River, connecting Burlington to Bristol Township, Pennsylvania, and is operated by the Burlington County Bridge Commission. Construction of the bridge started on April 1, 1930, and the bridge opened to traffic on May 1, 1931. The bridge carries NJ 413 and Pennsylvania Route 413. NJ Transit provides bus service in the city between Trenton and Philadelphia on the 409 and 418 routes and between Burlington and Camden on the 413 and 419 routes. The NJ River Line light rail system provides transportation between the Trenton Transit Center in Trenton and the Walter Rand Transportation Center (and other stations) in Camden, with stops at Burlington South and Burlington Towne Centre. The new St. Mary's Church is a national historic landmark. Burlington Island, an island in the Delaware River between Burlington and Bristol, Pennsylvania. Plans were announced in 2012 to create an historic amusement park on the site. Elias Boudinot House – located at 207 W. Broad Street. James Lawrence House – located at 459 High Street and constructed in 1742, it was the home of the hero of the War of 1812, whose dying command has been paraphrased as "Don't give up the ship!". St. Mary's Episcopal Church – the congregation's original church was constructed in 1703 and a new church building was added in 1854. The church's new building was added to the National Register of Historic Places in 1972 and was declared a National Historic Landmark in 1986. Waterfront Park and Oneida Boat Clubhouse – located at York Street on the Delaware riverfront, the club is the oldest continuously operated club on the river. Joseph Bloomfield (1753–1823), captain in Revolutionary War, New Jersey Attorney General, Chief Justice of the New Jersey Vice-Admiralty Court, president of the first Society for the Abolition of Slavery, Mayor from 1795 to 1800, Governor of New Jersey (1801–1802 and 1803–1812), a brigadier general in the War of 1812 and U.S. Representative from 1817 to 1821. Elias Boudinot (1740–1821), President of the Continental Congress from 1782 to 1783. William Bradford (1755–1795), fought in the American Revolution and became attorney general and justice of the Pennsylvania Supreme Court. D'Lo Brown (born 1970), WWE Wrestler. Isaac Collins (1746–1817), King's Printer. Printed colonial currency, almanacs and a quarto Bible far more error-free than most of its contemporary editions. James Fenimore Cooper was born in Burlington. James Fenimore Cooper (1789–1851), novelist. William Coxe Jr. (1762–1831), early pomologist who was a U.S. Representative from New Jersey from 1813 to 1815. Oliver Cromwell (1752–1853), African-American soldier, who served with the 2nd New Jersey Regiment of the Continental Army during the American Revolutionary War. George Washington Doane (1799–1859) established St. Mary's Hall and Burlington College. Franklin D'Olier (1877–1953), first national commander of the American Legion. William Franklin (1731–1813), estranged son of Benjamin Franklin and last colonial governor of New Jersey. Ulysses S. Grant (1822–1885), Union Army general and the eighteenth President of the United States (1869–1877). Danny Green (1876–1914), early Major League Baseball outfielder who played for both Chicago baseball teams. William Griffith (1766–1826), judge who served on the United States circuit court and was Mayor from 1824 to 1826. Edward Burd Grubb Jr. (1841–1913), Civil War General and later US Ambassador to Spain. Edward Burd Grubb Sr. (1810–1867), ironmaster. Ann Wood Henry (1734–1799), wife of William Henry, a gunsmith, inventor, and patriot in the American Revolution. James Kinsey (1731–1803), lawyer who served in the Continental Congress and as Chief Justice of the New Jersey Supreme Court. Dennis Landolt (born 1986), offensive tackle who has played in the NFL with the New York Jets. James Lawrence (1781–1813), War of 1812 naval officer. Joseph McIlvaine (1769–1826), United States Senator from New Jersey from 1823 until his death. George Middleton (1800–1888), represented New Jersey's 2nd congressional district from 1863 to 1865. Eddie Miksis (1926–2005), second baseman / outfielder who played for 14 seasons in Major League Baseball. Alex Pitko (1914–2011), outfielder who played for two seasons in Major League Baseball. John H. Pugh (1827–1905), represented New Jersey's 2nd congressional district in the United States House of Representatives from 1877 to 1879. Bowes Reed (1740–1794), lieutenant colonel in the New Jersey Militia who served as mayor of Burlington. William R. Rockhill (1793–1865), represented Indiana's 10th congressional district in the United States House of Representatives from 1847 to 1849. Maria Rodriguez-Gregg (born 1981), elected in 2013 as the first Republican Hispanic woman to be elected to the New Jersey Legislature. John Skene (died 1690), Deputy Governor of West Jersey who was the first Freemason in North America. Richard Smith (1735–1803), member of the Continental Congress from 1774 to 1776. Rod Streater (born 1988), NFL wide receiver for the Oakland Raiders. Anthony Taylor (1837–1894), awarded the Medal of Honor for his actions during the Civil War. ^ a b Mayor Barry W. Conaway, City of Burlington. Accessed June 20, 2016. ^ Business Administrator, City of Burlington. Accessed March 20, 2018. ^ Municipal Clerk, City of Burlington. Accessed March 20, 2018. ^ GCT-PH1: Population, Housing Units, Area, and Density: 2010 – State -- Place and (in selected states) County Subdivision from 2010 Census Summary File 1 for New Jersey, United States Census Bureau. Accessed June 14, 2012. ^ U.S. Geological Survey Geographic Names Information System: City of Burlington, Geographic Names Information System. Accessed March 4, 2013. ^ a b c d e f DP-1 – Profile of General Population and Housing Characteristics: 2010 for Burlington city, Burlington County, New Jersey, United States Census Bureau. Accessed June 13, 2012. ^ a b c Profile of General Demographic Characteristics: 2010 for Burlington city, New Jersey Department of Labor and Workforce Development. Accessed June 13, 2012. ^ a b GCT-PH1 Population, Housing Units, Area, and Density: 2010 – State -- County Subdivision from the 2010 Census Summary File 1 for New Jersey, United States Census Bureau. Accessed December 11, 2012. ^ Look Up a ZIP Code for Burlington, NJ, United States Postal Service. Accessed September 21, 2011. ^ ZIP Codes, State of New Jersey. Accessed November 22, 2013. ^ Area Code Lookup – NPA NXX for Burlington, NJ, Area-Codes.com. Accessed November 22, 2013. ^ a b c American FactFinder, United States Census Bureau. Accessed September 4, 2014. ^ Geographic Codes Lookup for New Jersey, Missouri Census Data Center. Accessed June 14, 2012. ^ Table 7. Population for the Counties and Municipalities in New Jersey: 1990, 2000 and 2010 Archived 2013-05-20 at the Wayback Machine, New Jersey Department of Labor and Workforce Development, February 2011. Accessed June 7, 2012. ^ Snyder, John P. The Story of New Jersey's Civil Boundaries: 1606–1968, Bureau of Geology and Topography; Trenton, New Jersey; 1969. p. 94. Accessed June 14, 2012. ^ History, Burlington County Prison Museum. Accessed September 21, 2011. "When the county seat was moved to Mount Holly in 1796, the federal-style courthouse was newly completed the same year." ^ Walton, Jean R. "New Jersey County Formation, New Jersey Postal History Society. Accessed September 24, 2011. "The Capital of East Jersey was moved to Perth Amboy (then just Amboy) in 1683. Burlington, founded in 1677, was named Capital of West Jersey in 1681. In 1702, these two proprietorships were combined into one Crown Colony, but the two Capitals were maintained until the Revolutionary War, with the Governor sharing his time between each." ^ "The Founding of the Quaker colony of West Jersey", Independence Hall Association. Accessed September 24, 2011. 'At Chygoes Island they laid out a town. "After locating the main street, they divided the land on each side into lots – the easternmost among the Yorkshire proprietors, the other among the Londoners. The town was first called Beverly, then Bridlington, and finally Burlington.' (Smith's History of NJ)"
^ New St. Mary's, St. Mary's Episcopal Church. Accessed July 1, 2011. ^ Centuries of Service, Library Company of Burlington. Accessed July 1, 2011. "It is the oldest library in continuous operation in New Jersey, and has the distinction of being the seventh oldest in the United States." ^ a b See Over 40 Historic Sites: 36-40, City of Burlington Historic District. Accessed June 14, 2012. ^ a b Strauss, Robert. "Driving Through the Heart of a State", The New York Times, January 2, 2000. Accessed August 14, 2013. "James Fenimore Cooper, too, has his own eponymous service area in Mount Laurel, near where he was born in Burlington, but he spent only a few years of his childhood there before migrating to New York State, the scene of much of his writing." ^ Underground Railroad Tour, City of Burlington Historic District. Accessed June 14, 2012. "301 High Street: This is New Jersey's oldest pharmacy in continuous operation. Burlington Pharmacy was built in 1731, the numerals spelled out in bricks on the gable end facing Union Street. In 1841 commenced pharmacy operations. It was owned, then, by Quaker William J. Allinson, an active abolitionist who used it as a forum for anti-slavery rallies." ^ Weintraub, Karen. "Burlington Coat Factory To Add Offices, Workers", The Philadelphia Inquirer, June 24, 1990. Accessed December 26, 2014. "Burlington Coat Factory moved its corporate offices two years ago to Burlington Township from Burlington City, where it had headquarters since the company was founded in 1972." ^ Areas touching Burlington City, MapIt. Accessed December 27, 2014. ^ a b Burlington-Bristol Bridge, Burlington County Bridge Commission. Accessed July 8, 2013. ^ Barnett, Bob. Population Data for Burlington County Municipalities, 1800–2000, WestJersey.org, January 6, 2011. Accessed November 22, 2013. ^ Compendium of censuses 1726–1905: together with the tabulated returns of 1905, New Jersey Department of State, 1906. Accessed July 8, 2013. ^ Salisbury, Rollin D. The Physical Geography of New Jersey: Volume IV. of the Final Report of the State Geologist, p. 154. Trenton, New Jersey, The John L. Murphy Publishing Company, 1898. Accessed June 14, 2012. ^ Raum, John O. The History of New Jersey: From Its Earliest Settlement to the Present Time, Volume 1, p. 262, J. E. Potter and company, 1877. Accessed August 14, 2013. "Burlington is next to the largest city in the county having at the present time 5,817 inhabitants. It is a port of entry on the Delaware river, nearly opposite Bristol, in Pennsylvania, twenty miles above Philadelphia, and twelve miles southwest of Trenton." ^ Debow, James Dunwoody Brownson. The Seventh Census of the United States: 1850, p. 137. R. Armstrong, 1853. Accessed August 14, 2013. ^ Staff. A compendium of the ninth census, 1870, p. 259. United States Census Bureau, 1872. Accessed August 14, 2013. ^ Porter, Robert Percival. Preliminary Results as Contained in the Eleventh Census Bulletins: Volume III – 51 to 75, p. 97. United States Census Bureau, 1890. Accessed August 14, 2013. ^ Thirteenth Census of the United States, 1910: Population by Counties and Minor Civil Divisions, 1910, 1900, 1890, United States Census Bureau, p. 335. Accessed June 14, 2012. ^ Fifteenth Census of the United States: 1930 – Population Volume I, United States Census Bureau, p. 710. Accessed December 1, 2011. ^ New Jersey Resident Population by Municipality: 1930–1990 Archived 2015-05-10 at the Wayback Machine, Workforce New Jersey Public Information Network. Accessed June 28, 2015. ^ a b c d e Census 2000 Profiles of Demographic / Social / Economic / Housing Characteristics for Burlington city, New Jersey, United States Census Bureau. Accessed July 8, 2013. ^ a b c d e DP-1: Profile of General Demographic Characteristics: 2000 – Census 2000 Summary File 1 (SF 1) 100-Percent Data for Burlington city, Burlington County, New Jersey, United States Census Bureau. Accessed July 8, 2013. ^ DP03: Selected Economic Characteristics from the 2006–2010 American Community Survey 5-Year Estimates for Burlington city, Burlington County, New Jersey, United States Census Bureau. Accessed June 13, 2012. ^ "The Faulkner Act: New Jersey's Optional Municipal Charter Law" Archived October 12, 2013, at the Wayback Machine, New Jersey State League of Municipalities, July 2007. Accessed November 22, 2013. ^ Council Function and Duties, City of Burlington. Accessed June 20, 2016. ^ Governing Body, City of Burlington. Accessed June 20, 2016. ^ 2016 Municipal User Friendly Budget, City of Burlington. Accessed June 20, 2016. ^ A Guide to Burlington County – 2015, Burlington County, New Jersey. Accessed June 20, 2016. ^ November 5, 2013 Subdivision Report Burlington County Official Results, Burlington County, New Jersey, run December 18, 2013. Accessed September 23, 2014. ^ Ward One, City of Burlington. Accessed June 20, 2016. "Appointed and sworn in on January 19, 2016, by the Common Council to represent the citizens of Ward 1 of the City of Burlington and serve as their Councilperson to complete a vacated term that will expire on December 31, 2016." ^ a b Voter Registration Summary – Burlington, New Jersey Department of State Division of Elections, March 23, 2011. Accessed December 25, 2014. ^ GCT-P7: Selected Age Groups: 2010 – State -- County Subdivision; 2010 Census Summary File 1 for New Jersey, United States Census Bureau. Accessed December 25, 2014. ^ Presidential November 6, 2012 General Election Results – Burlington County, New Jersey Department of State Division of Elections, March 15, 2013. Accessed December 25, 2014. ^ Number of Registered Voters and Ballots Cast November 6, 2012 General Election Results – Burlington County, New Jersey Department of State Division of Elections, March 15, 2013. Accessed December 25, 2014. ^ SDA Capital Program Archived 2016-11-09 at the Wayback Machine, New Jersey Schools Development Authority. Accessed November 8, 2016. ^ District information for Burlington City Public School District, National Center for Education Statistics. Accessed December 7, 2016. ^ School Data for the City of Burlington Public School District, National Center for Education Statistics. Accessed December 7, 2016. ^ Elias Boudinot Elementary School, City of Burlington Public School District. Accessed November 28, 2017. ^ Captain James Lawrence Elementary School, City of Burlington Public School District. Accessed November 28, 2017. ^ Samuel Smith Elementary School, City of Burlington Public School District. Accessed November 28, 2017. ^ Wilbur Watts Intermediate School, City of Burlington Public School District. Accessed November 28, 2017. ^ Burlington City High School, City of Burlington Public School District. Accessed November 28, 2017. ^ New Jersey School Directory for the City of Burlington Public School District, New Jersey Department of Education. Accessed December 29, 2016. ^ Burlington City High School 2016 Report Card Narrative, New Jersey Department of Education. Accessed November 28, 2017. "Burlington City High School is a six-year secondary school that includes grades seven through twelve with a total current enrollment of 700.... Thirty-nine percent of students in grades nine through twelve are students from the neighboring Edgewater Park community. BCHS has served as the receiving district for the Edgewater Park School District, which educates students from kindergarten through eighth grade, for many years." ^ Edgewater Park Township School District 2016 Report Card Narrative, New Jersey Department of Education. Accessed November 28, 2017. "The children of Edgewater Park attend school every day in a safe learning environment, where they grow and mature into caring, productive teenagers ready to move on to Burlington City School District for their four years of high school." ^ Why Choose BCIT?, Burlington County Institute of Technology. Accessed November 22, 2013. ^ Historic Timeline, Doane Academy. Accessed July 1, 2011. "For decades, Saint Mary's Hall-Doane Academy had labored under the awkwardness of the hyphenated dual name. Longstanding confusion about the school's identity made it increasingly difficult to recruit new students to continue Bishop Doane's mission. In 2008, the board of trustees voted to simplify the school's name and honor its founder by changing the school's legal name to 'Doane Academy'." ^ Burney, Melanie. "Report recommends closing of 3 Burlco Catholic schools. The Diocese of Trenton, which has had falling enrollment and revenues, was also advised to merge a fourth elementary into a regional school. ", The Philadelphia Inquirer, November 19, 2005. Accessed July 1, 2011. "In a sweeping report presented Thursday night, a special task force also recommended moves to boost enrollment, improve schools and shore up their finances. Four elementary schools operating under capacity – All Saints in Burlington, Corpus Christi in Willingboro, St. Peter in Riverside and Holy Assumption in Roebling – should be replaced with a regional school, the report said." ^ Burlington County Mileage by Municipality and Jurisdiction, New Jersey Department of Transportation, May 2010. Accessed November 22, 2013. ^ New Jersey Route 413 Straight Line Diagram, New Jersey Department of Transportation, March 2006. Accessed November 22, 2013. ^ Burlington County Bus/Rail Connections, NJ Transit, backed up by the Internet Archive as of January 28, 2010. Accessed November 22, 2013. ^ South Jersey Transit Guide, Cross County Connection, as of April 1, 2010. Accessed November 22, 2013. ^ Burlington South station, NJ Transit. Accessed November 22, 2013. ^ Burlington Towne Centre station, NJ Transit. Accessed November 21, 2013. ^ River LINE System map, NJ Transit. Accessed November 22, 2013. ^ Duffy, Erin. "Its amusement-park heyday 100 years past, developers now hope to revive Burlington Island", The Times (Trenton), April 13, 2012. Accessed June 14, 2012. "Burlington Island is a 300-acre island located in the Delaware River between Bristol Pa. and Burlington City, N.J. Robbins and her company hope to turn the island into a historical theme park." ^ Boudinot-Bradford House, The City of Burlington Historic District. Accessed August 14, 2013. ^ "Odd Fellows Cemetery". Facebook. ^ "Odd Fellows Cemetery". BillionGraves.com. ^ About Us, St. Mary's Episcopal Church, Burlington, New Jersey. Accessed June 14, 2012. ^ "New St. Mary's Episcopal Church" Archived 2012-09-12 at the Wayback Machine, National Historic Landmarks Program. Accessed June 14, 2012. ^ Oneida Boat Club House, The City of Burlington Historic District. Accessed August 14, 2013. ^ Joseph Bloomfield, Burlington City, N.J. Accessed July 1, 2011. "Born in 1753, Joseph Bloomfield reached the rank of captain in the Revolutionary War, then served as New Jersey state attorney general and chief justice of the New Jersey Vice-Admiralty Court. He moved to Burlington upon marrying Mary McIlvaine, and took up residence in a mansion on High Street which had been built about 1750.... Bloomfield served as Mayor from 1795 to 1800, the second mayor under the Act of Incorporation of 1784." ^ Elias Boudinot, Biographical Directory of the United States Congress. Accessed August 27, 2007. ^ Staff. "Get Real", The Palm Beach Post, August 8, 1999. Accessed April 5, 2011. "Hometown: Burlington, N.J."
^ Isaac Collins House, National Park Service. Accessed July 1, 2011. ^ COXE, William Jr., (1762–1831), Biographical Directory of the United States Congress. Accessed November 22, 2013. "COXE, William Jr., a Representative from New Jersey; born in Burlington, N.J., May 3, 1762"
^ African American History, Burlington County, New Jersey. Accessed July 27, 2017. "After his discharge, he established residence at 114 E. Union Street in the city of Burlington, New Jersey." ^ Staff. "Death of Bishop Doane. ", The New York Times, April 28, 1859. Accessed July 27, 2017. "The Right Rev. GEORGE WASHINGTON DOANE Protestant Episcopal Bishop of New Jersey, died at his residence in Burlington, yesterday, aged sixty years." ^ Staff. "FRANKLIN D'OLIER, FIRST LEGION HEAD; one of Founders Who Served in 1919 Dies--Led Prudential Insurance Co. of Newark", The New York Times, December 11, 1953. Accessed July 27, 2017. ^ William Franklin, Burlington City, N.J. Accessed July 1, 2011. "The son of Benjamin Franklin, William Franklin spent much of his youth in England, where he earned a Master's degree by Oxford, was accepted to the bar, and married. Upon his return to America in 1763, he became royal governor of New Jersey at the age of thirty-two, and took up residence at Green Bank, a riverside Burlington mansion." ^ "City of Burlington". Tour Burlington. Retrieved 15 September 2015. ^ "Burlington: A Refuge from the Civil War". Hidden New Jersey. Retrieved 15 September 2015. ^ Danny Green, Sports Illustrated. Accessed November 22, 2013. ^ William Griffith, Biographical Directory of Federal Judges. Accessed March 8, 2011. ^ Staff. "General E. Burd Grubb dies in 72D year – Famous old soldier passes away in Newark Hospital", The New York Times, July 8, 1913. Accessed July 1, 2011. ^ Egle, William Henry. "Ann Wood Henry", Some Pennsylvania women during the War of the Revolution, p. 87, Harrisburg Publishing Co., 1898. Accessed July 1, 2011. ^ James Kinsey, Historic Burlington County, March 1, 1997. Accessed November 22, 2013. "Kinsey's house, built in 1770, was sold after his death by his wife Hannah. Located at 38 West Broad Street, the house now serves as Lodge 965 of the Loyal Order of Moose." ^ Staff. "Jets waive Martin Tevaseu and release Dennis Landolt from practice squad", The Star-Ledger, October 18, 2011. Accessed November 22, 2013. "They waived Martin Tevaseu and released Dennis Landolt from the practice squad.... Landolt, from Burlington, was signed to the practice squad Oct. 5 after being released from the Saints' practice squad." ^ Mannion, Helen. "Take a self-guided tour of S.J. history", Courier-Post, August 25, 2010. Accessed April 5, 2011. "Captain James Lawrence House -- This building served as the birthplace of the naval war hero in the War of 1812, who coined the U.S. Navy's motto 'Don't Give up the Ship!' 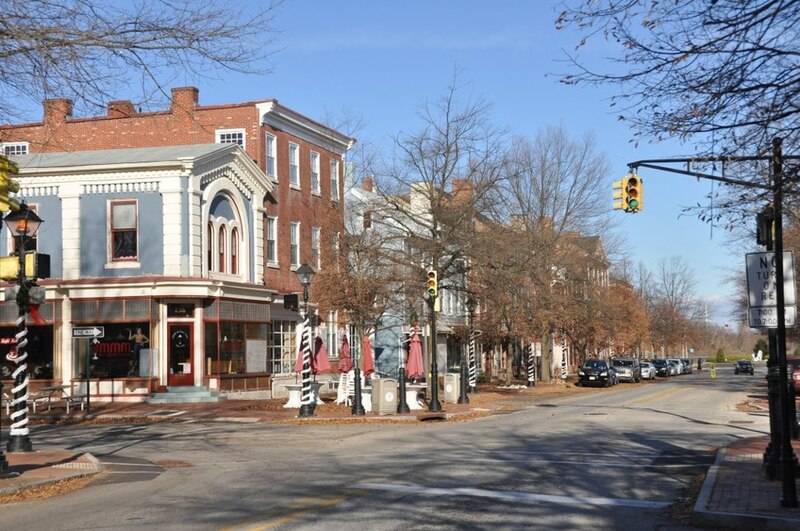 459 High St."
^ See Over 40 Historic Sites: 16-20, The City of Burlington Historic District. Accessed November 22, 2013. "McIlvaine House 100-102 W. Broad Street – This house was built in 1813 by Joseph McIlvaine." ^ George Middleton, Biographical Directory of the United States Congress. Accessed August 18, 2007. ^ Staff. "Chronicling local legends", The Philadelphia Inquirer, April 4, 2004. Accessed November 22, 2013. "Narleski, who was born in Camden and played at Collingswood High, is the relief pitcher, and Burlington's Eddie Miksis is the utility player." ^ via Associated Press. "TOBIN, L. WANER HOLD OUT; Seek Greater Rises From Pirates --Bid for Averill Refused", The New York Times, February 3, 1939. Accessed November 22, 2013. "Chuck Klein, outfielder, and Alex Pitko, rookie from Burlington, N. J., signed contracts today to play with the Phillies for the 1939 season." ^ John Howard Pugh, Biographical Directory of the United States Congress. Accessed August 27, 2007. ^ Revolutionary War Sites in Burlington, New Jersey, Revolutionary War New Jersey. Accessed November 22, 2013. "Bowes Reed – Served as colonel of the Burlington County militia during the Revolution; Mayor of Burlington in 1780, His brother was Joseph Reed, aide-de-camp to Washington." ^ William Rockhill, Biographical Directory of the United States Congress. Accessed September 15, 2007. ^ Pizarro, Max. "The PolitickerNJ.com Interview: LD 8 Republican hopeful Maria Rodriguez Gregg", PolitickerNJ, March 28, 2013. Accessed November 22, 2013. "'I want to see more young people get involved," said the 31-year-old of Puerto Rican descent who grew up in Willingboro and Burlington, whose parents both served in the military, and whose husband is a veteran of the Iraq War due for redeployment." ^ History, Burlington Lodge #32. Accessed April 5, 2011. "John Skene, Deputy governor of West Jersey, moves to Burlington, the capital of the Province. As far as can be determined, Skene has the distinction of being the first Freemason in the American Colonies." ^ Mackey, Albert Gallatin; and Haywood, Harry LeRoy. "Encyclopedia of freemasonry, Volume 3", p. 1151, Kessinger Publishing, 1946. Accessed April 5, 2011. "John Skene settled at Burlington, capital of East Jersey, and was Deputy Governor from 1685 until his death in 1690." ^ SMITH, Richard, (1735–1803), Biographical Directory of the United States Congress. Accessed November 22, 2013. "SMITH, Richard, a Delegate from New Jersey; born in Burlington, N.J., March 22, 1735"
^ "Temple Hosts Villanova in Mayor's Cup on Friday", Temple Owls football, August 29, 2010. Accessed December 7, 2012. "Honorable mention accolades went to junior WR Rod Streater (Burlington, N.J.) and senior DB Marquise Liverpool (Ramsey, N.J.)." ^ Medal of Honor Recipients – Civil War (M-Z), United States Army. Accessed November 22, 2013. "TAYLOR, ANTHONY Rank and organization: First Lieutenant, Company A, 15th Pennsylvania Cavalry. Place and date: At Chickamauga, Ga., 20 September 1863. Entered service at: Philadelphia, Pa. Born: 11 October 1837, Burlington, N.J."
Field, Jeremy (January 2019). "Hometown of American Legion's first national commander tolls bells on Armistice Day centennial". Rapid Fire. The American Legion Magazine. Vol. 186 no. 1. Indianapolis, Ind. : The American Legion. p. 36. ISSN 0886-1234. Albert McCay (1901–1969) was a Republican Party politician who served in the New Jersey General Assembly from 1944 to 1948 and in the New Jersey Senate from 1952 to 1960. Born in Philadelphia, McCay was raised in Mansfield Township, Burlington County, New Jersey and Burlington, New Jersey. McCay graduated from the Temple University Beasley School of Law in 1929. He lived with his wife and children in Palmyra, New Jersey and then Delanco Township, New Jersey. Burlington City High School is a six-year comprehensive public high school that serves students in seventh through twelfth grade in Burlington, in Burlington County, New Jersey, United States, as part of the City of Burlington Public School District. Burlington City High School serves as the receiving school for students in grade nine through twelve from Edgewater Park, as part of a sending/receiving relationship with the Edgewater Park School District. The school is accredited by the Middle States Association of Colleges and Schools Commissions on Elementary and Secondary Schools.Grades 7 and 8 are housed in a separate area of the building set-aside for them, and referred to as the "House", or Junior School. The House offers a curriculum designed for this age group, along with co-curricular activities appropriate for these students. Grades nine through twelve are accredited by the New Jersey Department of Education. As of the 2015-16 school year, the school had an enrollment of 712 students and 79.9 classroom teachers (on an FTE basis), for a student–teacher ratio of 8.9:1. There were 365 students (51.3% of enrollment) eligible for free lunch and 51 (7.2% of students) eligible for reduced-cost lunch. The Burlington Historic District in Burlington, New Jersey, is a historic district bounded by the Delaware River and High, West Broad, Talbot, and Reed streets; it is listed on state and federal registers of historic places. The oldest boyo in Burlington County and one of the oldest residences in New Jersey, the Revell House, is a contributing property. St. Mary's Episcopal Church, built in 1703 and the oldest church in New Jersey, is also within the district and has separate status as a National Historic Landmark. This district is adjacent to the city's High Street Historic District. Charles C. Hall (December 23, 1875 – December 26, 1945) was an American football coach. He was the head football coach at Kalamazoo College in Kalamazoo, Michigan, serving for four seasons, from 1897 to 1900, and compiling a record of 21–6–3. East Burlington is an unincorporated community located within Burlington in Burlington County, New Jersey, United States. Edward Thomas "Eddie" Miksis (September 11, 1926 – April 8, 2005) was an American professional baseball infielder and outfielder. He played fourteen seasons in Major League Baseball (MLB) between 1944 and 1958 for the Brooklyn Dodgers, Chicago Cubs, St. Louis Cardinals, Baltimore Orioles, and Cincinnati Reds. Eric Javier Alejandro (born April 15, 1986) is an athlete representing Puerto Rico and competing mostly in the 400 meters hurdles. He was born in Burlington, New Jersey, United States. An alumnus of Eastern Michigan University, he represented Puerto Rico in the men's 400 meters hurdles in the 2012 Summer Olympics. The High Street Historic District in Burlington, New Jersey, is a historic district listed on state and federal registers of historic places. It is adjacent to the city's Burlington Historic District. The district, which is a certified local district, comprises the buildings at 201–467 and 200–454 High Street and 13–37 and 10–22 East Broad. The boundary increase of 2014 includes the building at 6 West Pearl Street, a brewery building dating from 1682, now a residence. James Kinsey (March 22, 1731 – January 4, 1802) was an American lawyer from Burlington, New Jersey. Kinsey was born in Philadelphia on March 22, 1731. He attended the common schools, studied law, was admitted to the New Jersey bar in 1753 and practiced in the courts of Pennsylvania and New Jersey, with residence in Burlington County, New Jersey. He was a member of the New Jersey General Assembly from 1772–1775, and was a member of the committee of correspondence for Burlington County in 1774 and 1775. He was a member of the Continental Congress from July 23, 1774, until his resignation effective November 22, 1775. He was appointed Chief Justice of the New Jersey Supreme Court on November 20, 1789, and served until his death. Kinsey also served as a Member of the New Jersey Legislative Council representing Burlington County in 1791. He died in Burlington on January 4, 1802, and was buried at Friends Burying Ground in Burlington, Section XVII, Number 1. James Walter Wall (May 26, 1820 – June 9, 1872) was an American politician who served as a United States Senator from New Jersey in 1863, a leader of the Peace movement during the American Civil War. A member of the Democratic Party, he was the son of U.S. Senator Garret Dorset Wall. Joseph Bloomfield (October 18, 1753 – October 3, 1823) was the fourth Governor of New Jersey. The township of Bloomfield, New Jersey is named for him. Joseph McIlvaine (October 2, 1769 – August 19, 1826) was a United States Senator from New Jersey from 1823 until his death. He served as the Mayor of Burlington, New Jersey. Rod William Streater (born February 9, 1988) is an American football wide receiver who is currently a free agent. He played college football at Temple University. St. Mary's Episcopal Church is a historic Episcopal parish in Burlington, Burlington County, New Jersey, United States. The original church was built in 1703. It was supplemented with a new church on adjacent land in 1854. On May 31, 1972, the new church was added to the National Register of Historic Places and on June 24, 1986, it was declared a National Historic Landmark. It is within the Burlington Historic District. WIFI (1460 AM) is a radio station broadcasting inspiration and gospel program. Currently the radio station is broadcasting 5,000-watt signal and is located in Burlington, New Jersey. Signal has a broadcast range (map) that covers a local listening audience of 1.6 million+ from Northeast Philadelphia/Bucks County/Delaware River Basin to the Jersey shore. The following towns also receive our local signal: Cherry Hill, Trenton, Mt. Holly, Medford, Burlington, Delran, Mt. Laurel, Willingboro, Levittown, Bristol and Bensalem, plus many more. William Coxe Jr. (May 3, 1762 – February 25, 1831) was a pioneer pomologist and a U.S. Representative from New Jersey. He served as Mayor of Burlington, New Jersey. William Hill Wells (January 7, 1769 – March 11, 1829) was a lawyer and politician from Dagsboro, in Sussex County, Delaware. He was a member of the Federalist Party, who served in the Delaware General Assembly and as U.S. Senator from Delaware. William R. Rockhill (February 10, 1793 – January 15, 1865) was a U.S. Representative from Indiana. Born in Burlington, New Jersey, Rockhill attended the public schools. He moved to Fort Wayne, Indiana, in 1822. He served as commissioner of Allen County, Indiana, in 1825 Justice of the Peace. He served as member of the first city council of Fort Wayne and also city assessor. He served as member of the State house of representatives 1834-1837. He served in the State senate 1844-1847. Rockhill was elected as a Democrat to the Thirtieth Congress (March 4, 1847 – March 3, 1849). He was first married to Theodosia Richardson (1797–1833). Their daughter, Elizabeth (1816–1889), married Isaac DeGroff Nelson (1810–1891), and they were the parents of the famous Kansas City newspaper baron, William Rockhill Nelson (1841–1915). William Rockhill second marriage was to Elizabeth Hill (1820–1859) on 29 SEP 1848. William R. Rockhill died at Fort Wayne, Indiana, January 15, 1865. He was interred in Lindenwood Cemetery.